After an wonderful day of getting ready and ceremony images, a stunning sunset session along the Cape Fear River and a delicious meal and light dancing, we ventured into the dark streets of Wilmington to create some nighttime images of my newlyweds. Using a large aperture and the lights of the area, we worked to create some fun pictures with a bit of a grainy, film-like look. We had already hit a couple alleys, a bright wall and the boardwalk right out side of The River Room, so I was looking for something a little different for this image. This location was the perfect spot fo what I envisioned. With wrapped light on the left, overhead lights to the right and a touch of soft light coming the bar on the right, we positioned the groom so that no lights were coming out of his head and had him slightly dip his bride back. These two were pros at one of the images most couples have a tough time with! For anyone that knows me or has worked with me, you know my love of using flash to really set images off. For this set of images, I wanted to give the couple a little something out of my norm. While I could have easily use flash for these images, I choose to go natural light, using a higher ISO than I normally would coupled with shooting my 85 1.4 wide open. This combination of ISO and aperture really changes the fell of the images, giving a softer look with feel of film from the grain in the image. 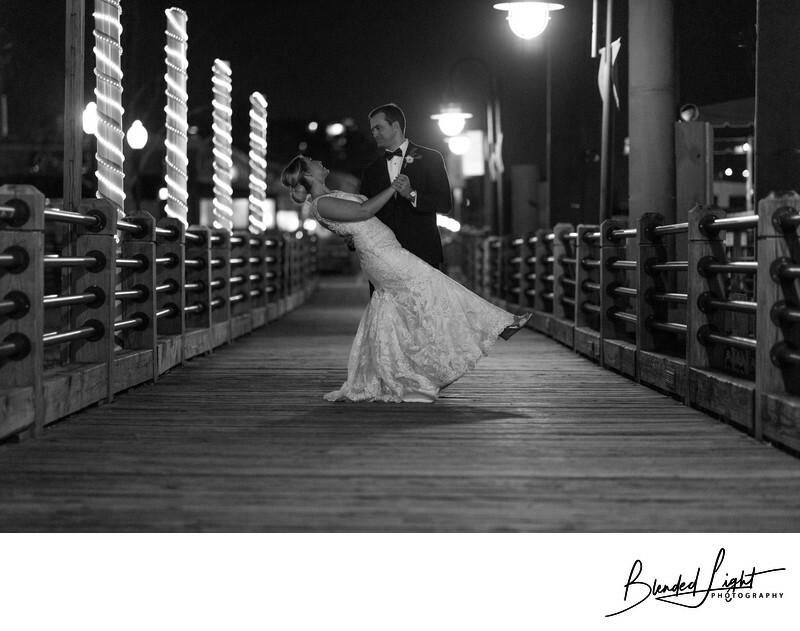 It's a simple and fantastic way to to deviate a touch from your regular process and add a little drama to the images! Location: The River Room, 18 S Water St, Unit 2, Wilmington, NC 28401. 1/200; f/1.4; ISO 5000; 85.0 mm.